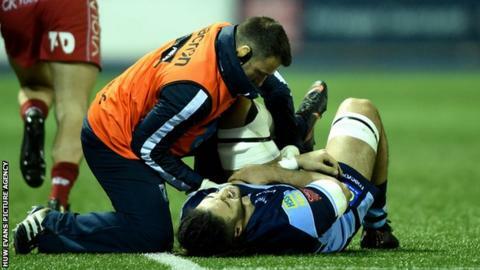 Cardiff Blues flanker Josh Navidi and Scarlets prop Rob Evans picked up elbow injuries during Friday's Pro14 derby. Navidi was taken off two minutes into Blues' 41-17 win after dislocating his elbow, but coach John Mulvihill expects him to return in "three to four weeks". Meanwhile the Scarlets will wait until Monday to determine the extent of the injury to Rob Evans' elbow. However Scarlets coach Wayne Pivac said the prop looked "okay in the changing room" following Friday's match. Evans scored two second-half tries after coming on at half-time as a replacement but a dominant first-half display had put the result at the Cardiff Arms Park beyond doubt. Navidi's injury will see him miss the Blues' trip to Munster but he could be in contention for a return against Connacht on 13 April.